The Pew Center for Arts & Heritage announces grants for 2017! The 2017 Voloshky discovery project will explore Crimean Tatar choreography for consideration in Voloshky’s repertoire. Rooted in indigenous culture, Crimean Tatar choreography is nothing like other works in Voloshky’s repertoire. This will be the first time an American-Ukrainian organization will work collaboratively with indigenous Crimean Tatars at the source, to discover and identify choreographic practices and legacies in order to become more knowledgeable for the next phase of work – to incorporate Crimean choreography into Voloshky’s repertoire with integrity. Voloshky artistic Director Taras Lewyckyj will work with Ayla Bakkalli to assemble meetings with leading Crimean Tatar cultural artists in Ukraine to explore and plan for a comprehensive artistic collaboration in 2018. Ayla Bakkalli is an executive member of the World Congress of Crimean Tatars, an advisor to the Ukrainian permanent UN Mission on Indigenous Matters, and the U.S. representative of the Crimean Tatar Mejlis. On March 14, 2017, Mid Atlantic Arts Foundation (MAAF) announced grants to 12 dance and 10 music ensembles from across the United States to support their engagements in 17 countries around the globe through the 2017 USArtists International (USAI) program. Voloshky Ukrainian Dance Ensemble is proud to announce that with MAAF support, the company will travel to Ukraine this summer to conduct artistic and humanitarian initiatives together with the Ukrainian Federation of America (UFA). The trip will be timed to coincide with the Lviv Ukrainian Dance Festival and a healthcare convention organized by the UFA. Voloshky needs your help to make this Ukraine initiative a success. While the prestigious MAAF grant allows for 4 artists to travel to Ukraine, Voloshky intends to send 25 artists. We are looking to raise an additional $75,000. Please consider generously supporting this cause! Below is a link to a video that I produced with filmmaker Henry Nevison. The song is recorded in Philadelphia at a performance I produced in September 2012. The musical artists are from Kirovohrad. The musical arrangement and words were created thru a commissioned by Voloshky. It is a presentation of Voloshky Ukrainian Dance Ensemble and The Ukrainian Federation of America to the people at EuroMaidan. Three Dance Programs…Designed to entertain, engage, and inform! 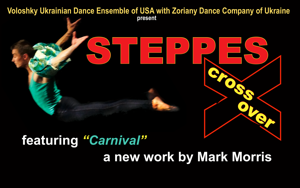 STEPPES: Crossover is a new evening-length performance that takes audiences on an exciting journey from folk to contemporary dance. Featuring over 35 dancers and musicians, the program underscores America’s unique pluralistic heritage and multicultural inspirations. Featuring a new work by Mark Morris, experience the bold acrobatics of Ukrainian dance and ingenious artistry of the dancers set in motion by a live, virtuosic orchestra from Kirovohrad, Ukraine. 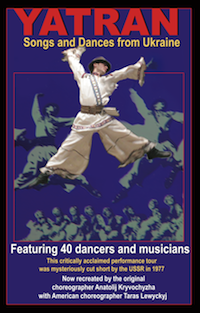 This unique program is based on the work of the Yatran Ukrainian Dance Company of Kirovohrad, Ukraine that toured in the U.S. in 1977. Together, original choreographer Anatolij Kryvochyzha (now age 87) and American choreographer Taras Lewyckyj theatrically recreated the highly acclaimed Yatran program with the Zoriany Ukrainian Dance Company in Kirovohrad, Ukraine. The result is an incredibly lively and exciting show featuring over 40 dancers and musicians. “… the Ukrainian Dance Company Yatran arrived for a far, far too brief two-night engagement as part of the Radio City Music Hall Pop Festival. It should be brought back as soon as possible. Two nights is by no means long enough to get even acquainted. [Kryvochyzha] knows how to point up a folk dance, his program moves exceptionally smoothly, and he understands the need to vary the pace and texture of the various numbers”. This program combines the highest level of technique and presentation with the national character of Ukraine to create a spellbinding show of art and energy. The resulting style is bold and powerful, clearly native to Ukrainian dance, yet classical enough to be appreciated by all. Through dance, Voloshky portrays the past and present culture of the Ukrainian people. Featuring works by many world-renowned choreographers, audiences are exposed to traditional costumes, styles, and music representing various regions of Ukraine. 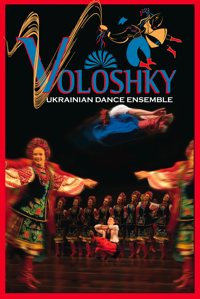 The Voloshky Ukrainian Dance Ensemble of Philadelphia is currently hosting a joint artistic project with Zoriany Ukrainian Song and Dance Company from Kirovohrad, Ukraine during August and September, 2012. During this time the groups are working together on major artistic projects and performances. One of the most significant endeavors for both companies is the collaboration on a new contemporary work by world-renowned choreographer, Mark Morris. Both companies have also worked over the past 8 years on recovering and restaging the famed Yatran performance program that toured the USA in 1977. With support from The Pew Center for Arts and Heritage, Voloshky has commissioned an original work by Morris during its 40th season. Morris has been referred to as “the most important choreographer since Balanchine.” His work is deeply rooted in culture and custom–seamlessly integrating elements drawn from traditions as diverse as Eastern European folk dance, classical ballet, and modern dance. The new work is currently being set on the Voloshky and Zoriany dancers by Morris during three weeks at the Mark Morris Dance Center in Brooklyn, NY. The new work will be shown during a preview performance at Bryn Mawr College’s McPherson Auditorium in Bryn Mawr, PA on Friday, September 14th at 8:00 p.m. The Zoriany Company includes over 30 dancers and musicians. During its U.S. visit it will perform dances and songs from a highly acclaimed program which briefly toured the US in 1977 under the company’s former name, the Yatran Song and Dance Ensemble. Earlier this summer, Voloshky Artistic Director Taras Lewyckyj and Anatoly Kryvochyzha culminated eight years of work in Kirovohrad, Ukraine and restaged original choreographies from the 1977 Yatran program. Kryvochyzha was Artistic Director and Chief Choreographer of Yatran Ensemble from 1957 to 1978. During his tenure as head of Yatran, the company grew from an enthusiastic amateur group to one of the finest professional folk ensembles in Europe. Yatran made a brief visit to the U.S. in 1977 but was abruptly and mysteriously canceled by soviet authorities. Although the tour was brief, it made a very lasting impression. The commission of Mark Morris to create a piece for the Voloshky Ukrainian Dance Ensemble has been supported by The Pew Center for Arts & Heritage through Dance Advance. The Yatran Choreography Recovery and Restaging Project has been supported by The Pew Center for Arts & Heritage through Dance Advance.